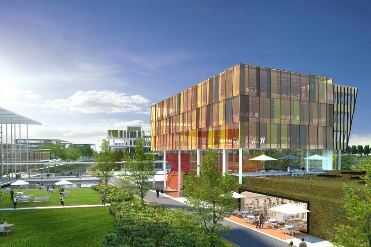 FOX Vakanties, a 100% subsidiary of ANWB, will take up residence at the new business park, Park 20|20 in Hoofddorp. FOX Vakanties, presently located in Nieuw Vennep, expect to move to their new office in Hoofddorp during the first quarter of 2012. The colours and scents of the world can be found in the architecture and design. ANWB will become owners of the a unique tailormade new office with the ambition of optimum sustainability and a BREAAM-score ‘Excellent. Working closely with the developer and interior designer, Buro Bogaarts Interiordesign, the building will be fully equipped to meet all required specifications. An important component of the new building is the travel theatre. It is here that many events will take place, events which are an ideal means for preparation to far away destinations and travel. This feature of the building couples nicely to the Park 20|20 concept whereby 24/7 activity and industriousness are pursued. The theatre can also be blocked off separately for use by third parties if necessary. The sustainable nature of the building and its ambition for a BREEAM-score Excellent links well with FOX Vakanties aim to realise their own sustainable objectives, alongside their core business. The first quarter of 2012 this should be the new home for the approximate 100 employers of this dynamic organisation. The office building, with a floor surface area of approximately 3.550 m2 and 77 parking places, is under development by Park 20|20 CV, a joint venture between Delta Development Group, Reggeborgh Group and Volker Wessels. IBB Kondor, a branch of VolkerWessels, is the construction company. The architect and supervisor of the overall concept is William McDonough, creator of the Cradle-to-Cradle (C2C) philosophy. An important component of the new building is the travel theatre. It is here that many events will take place, events such as ‘’Sound & Light shows’’ which are an ideal means for preparation to far away destinations and travel. This feature of the building couples nicely to the Park 20|20 concept whereby 24/7 activity and industriousness are pursued. The theatre can also be blocked off separately for use by third parties if necessary. Wij gaan in Winterswijk-Kotten onze schuur verbouwen tot cursusruimte en gaan ook aan de slag met de BREEAM certificering. Deze is zeer ambitieus (met zo’n beetje alles wordt hierin rekening gehouden), maar we hebben er veel zin in om net als FOX de score ‘excellent’ te halen. Dat gaat alles vragen van ons opdrachtgevers, bouwonderneming, projectleider en adviseurs. Het oude gebint zal opnieuw gebruikt worden, het geheel zal zwaar geisoleerd worden, we denken aan een houtgestookte cv-installatie met snoeihout uit de omgeving, drievoudig glas en natuurverf en leemstuc voor het binnenwerk. Dat klinkt goed. Heb jullie website even bekeken en zie daar heel veel mooie duurzame initiatieven. Mooi voorbeeld van hoe het ook kan in Nederland.